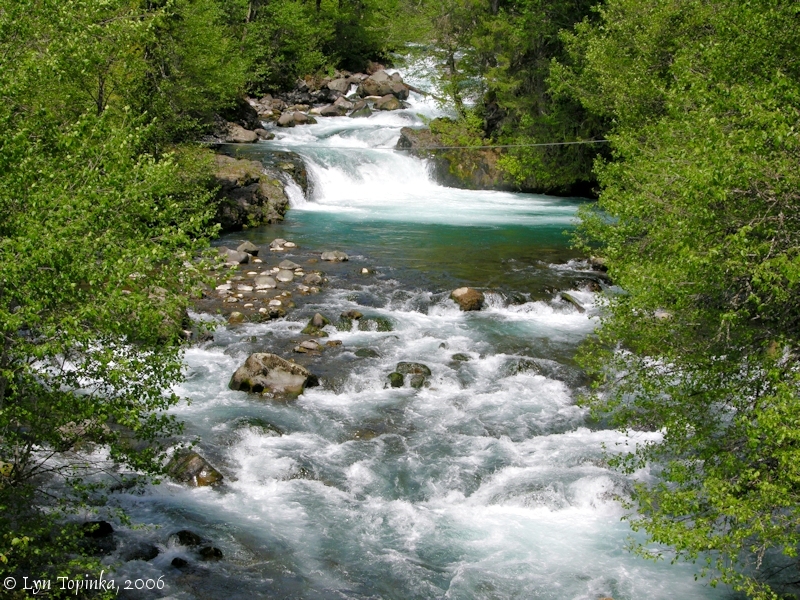 "Little White Salmon River, Washington"
Click image to enlarge Little White Salmon River at Willard, Washington. View looking upstream from the Cook-Underwood Road. Image taken March 18, 2013. 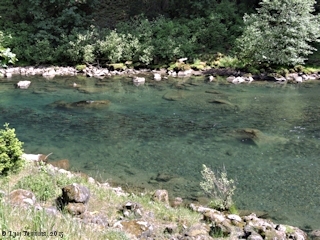 The Little White Salmon River is located appoximately 5 miles downstream of the White Salmon River, and can be reached off of Washington State Highway 14. 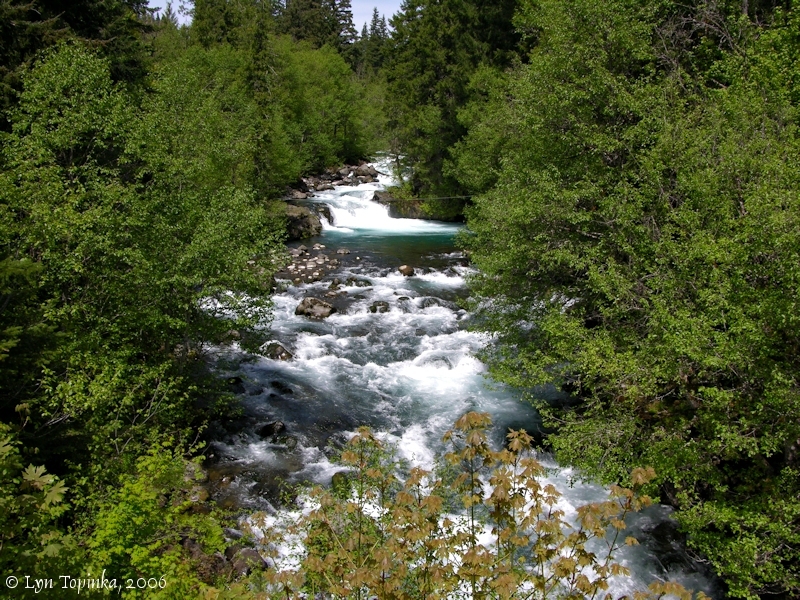 The Little White Salmon River originates in the Gifford Pinchot National Forest in south-central Washington and enters Drano Lake above Cook, Washington. Upstream is the small community of Hood, the Broughton Mill and the Spring Creek Fish Hatchery. 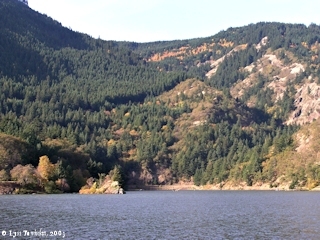 Downstream of the Little White Salmon River and Cook is Dog Mountain, Grant Lake, and Wind Mountain. Lewis and Clark did not observe the Little White Salmon River, but they did mark its course on their route map (Moulton, vol.1, map#78). Historians believe the information of the existence of this river came from local Native Americans who lived in the area. The Corps camped the evening of October 29, 1805, near a "Pond" close to the northern shore of the Columbia, and marked the lake on their route map. This body of water is now known as Drano Lake, with the look changed by backwaters from Bonneville Dam and highway construction. The route map (Moulton, vol.1, map#78), shows Lewis and Clark's campsite of October 29, 1805, being on the Washington side of the Columbia just upstream of the Little White Salmon River. The Little White Salmon is unnamed. The map shows the mouth leading into a small pond which is labeled "Little Lake C", leading into the rest of the stream. Captain Clark also wrote the name "Little Lake Creek" in his "Estimated Distances". 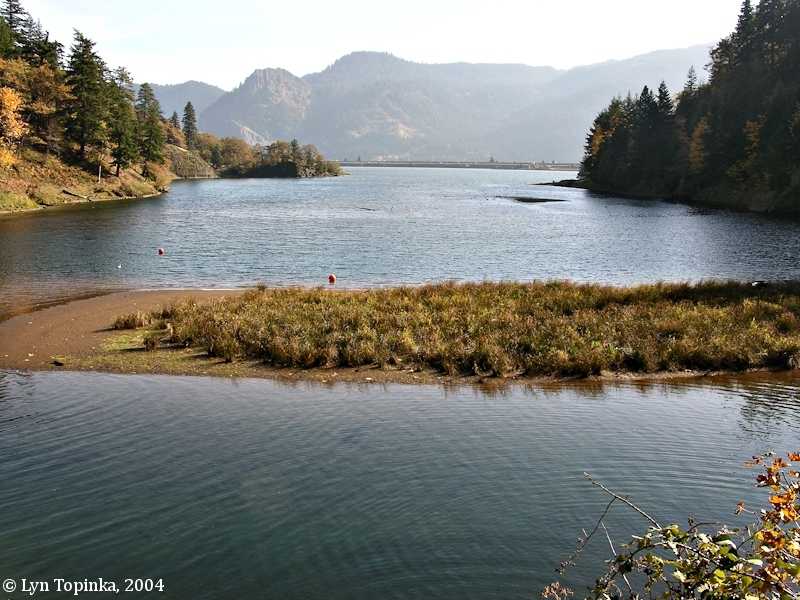 Lewis and Clark's previous campsite was on the Oregon side of the Columbia on Rocky Island at the base of Crates Point. 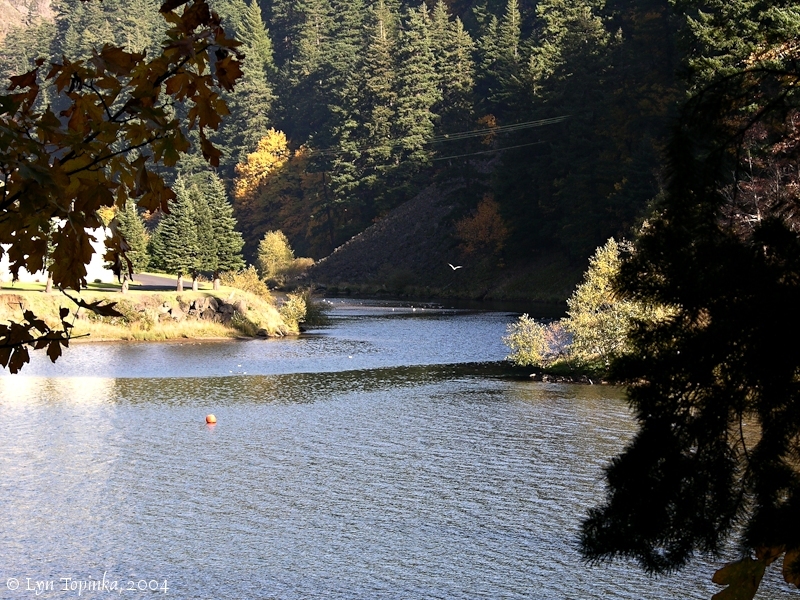 Their campsite of October 30 and 31st on the Washington side of the Columbia River near Ashes Lake. According to the Columbia Basin Fish and Wildlife Authority website (2004), the Little White Salmon River drains approximately 135 square miles of Skamania and Klickitat counties, Washington, over a distance of approximately 19 miles. Principle tributaries to the Little White Salmon River include Lost (north and south), Beetle, Lusk, Homes, Berry, Cabbage, Moss, and Rock creeks. 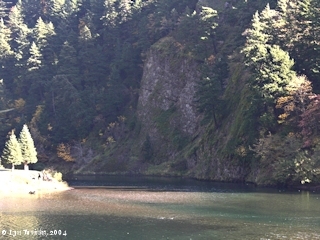 The geology of the Little White Salmon watershed is dominated by past volcanic activity, with soils being the result of volcanism and glaciation. he basin is oriented northwest to southeast. Elevations range from 80 feet to 5,300 feet, with topography varying from gentle slopes formed by lava flows and volcanic cones to steep rugged landforms. Based on geomorphology the watershed can be split into one area containing tertiary deposits of tuff and pyroclastic flow (Monte Cristo Range) and another containing younger quaternary basalt/andesite flows originating from the Indian Heaven Area. The Big Lava Bed flow covers 16,000 aces of the watershed. 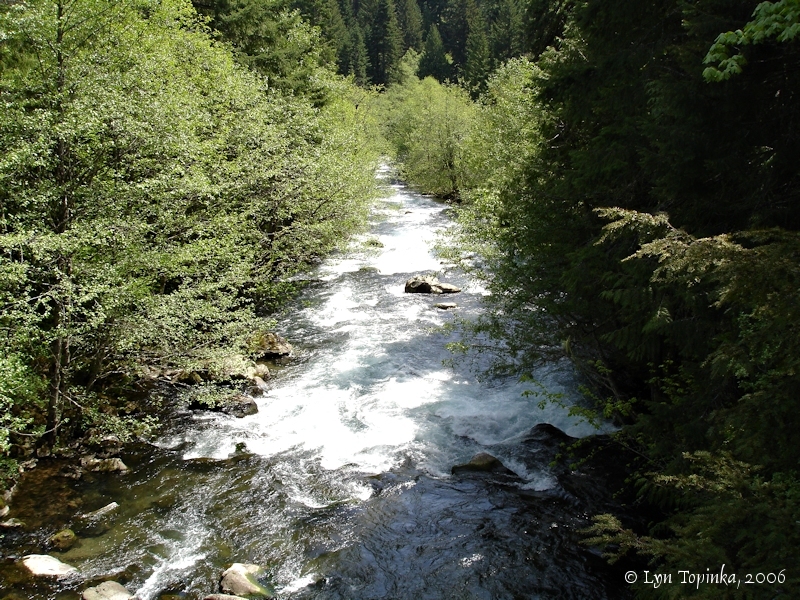 The mainstem of the Little White Salmon River drops 3,520 feet in 19 miles for an average gradient of 3.5 percent. 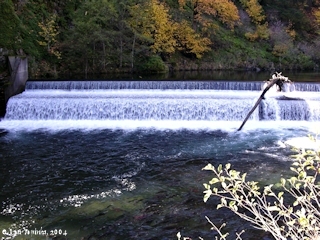 Anadromous fish passage is blocked by a series of waterfalls located 2 miles upstream from the rivers confluence with the Bonneville Reservoir. 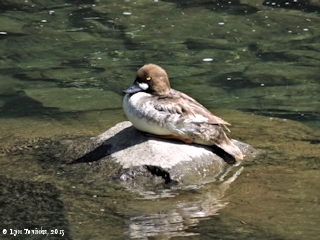 Click image to enlarge Common Goldeneye, Little White Salmon River, Washington. Image taken May 9, 2015. 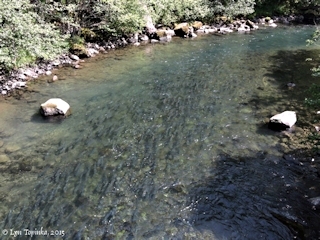 Little White Salmon River, etc. Drano Lake confluence with the Columbia River. 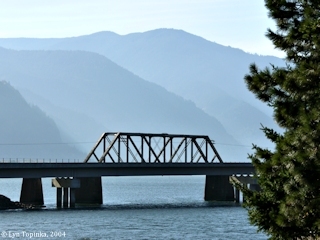 Click image to enlarge Drano Lake looking towards the Columbia River. Image taken November 4, 2004. The Little White Salmon River drains into Drano Lake. Drano Lake, is backwater created by impoundment of the Columbia River, and enters the Bonneville Reservoir at Columbia River Mile (RM) 162. 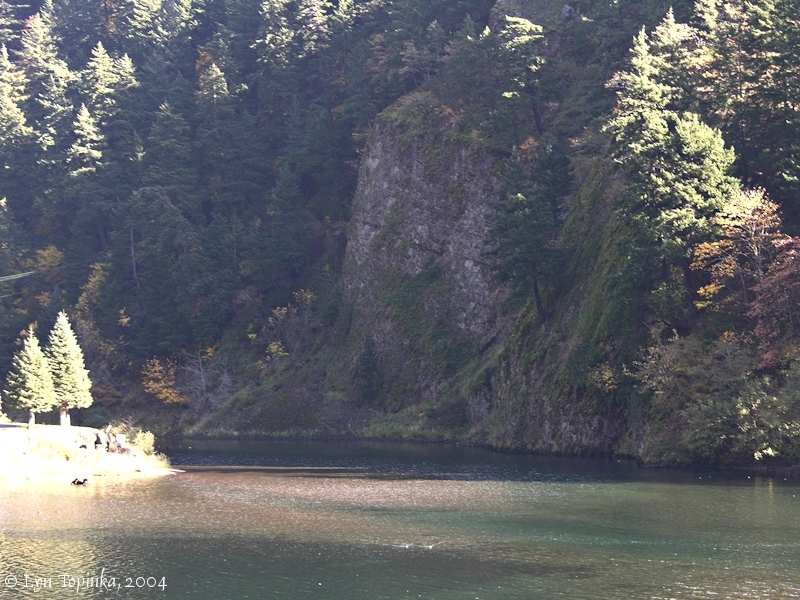 Slack water from Drano Lake extends some distance up the Little White Salmon River. The lake is a popular fishing spot and hosts a boat ramp. It can be reached from Washington State Highway 14. Click image to enlarge Drano Lake, Washington. 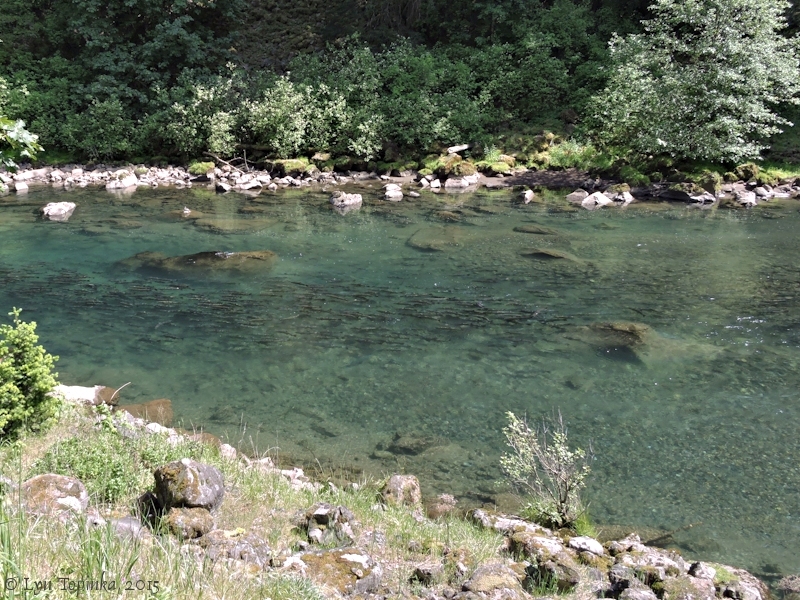 View from near the mouth of the Little White Salmon River. Image taken November 4, 2004. Click image to enlarge Looking across Drano Lake towards channel leading to the Little White Salmon River. The "mouth" of the Little White Salmon River is 1/2 mile behind the "island", as seen from the Drano Lake boat ramp area. Image taken October 25, 2003. 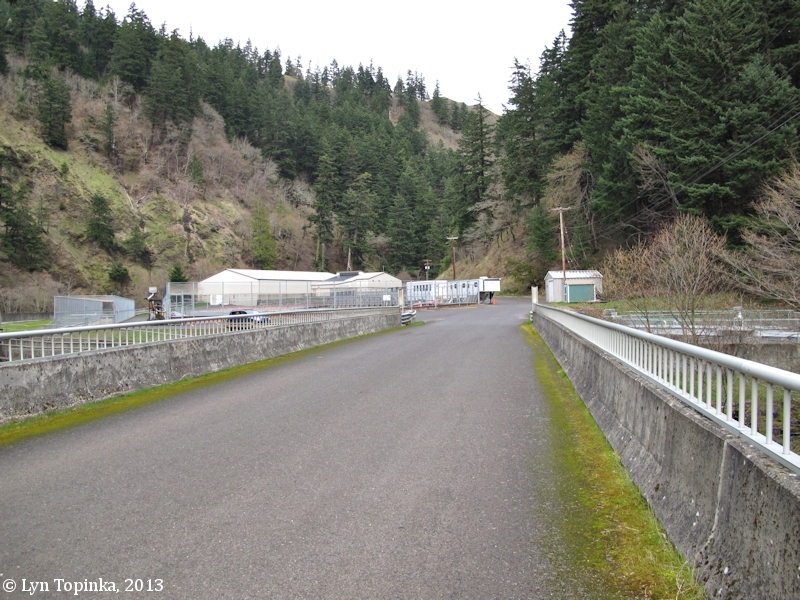 Click image to enlarge Mouth of the Little White Salmon River, Washington, at fish hatchery. Image taken November 4, 2004. Click image to enlarge Mouth of the Little White Salmon River, Washington. Image taken November 4, 2004. 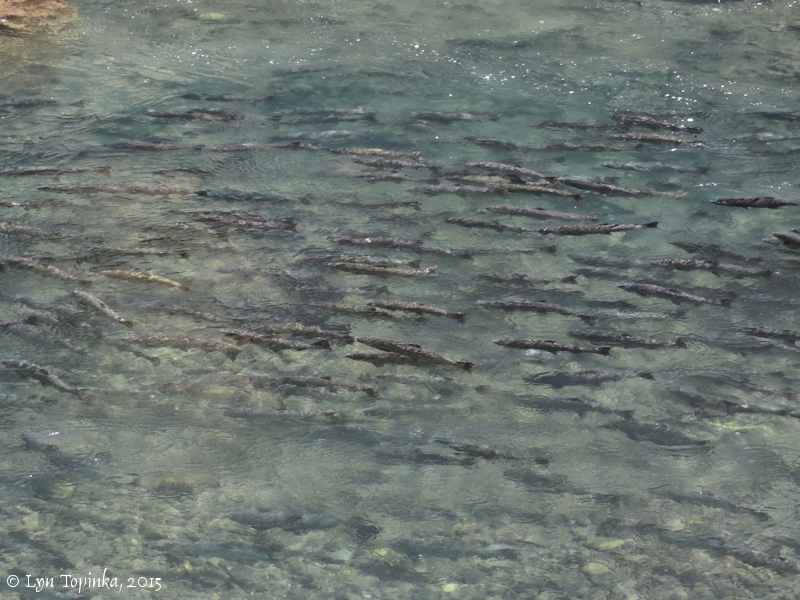 Click image to enlarge Salmon, Little White Salmon River, Washington. 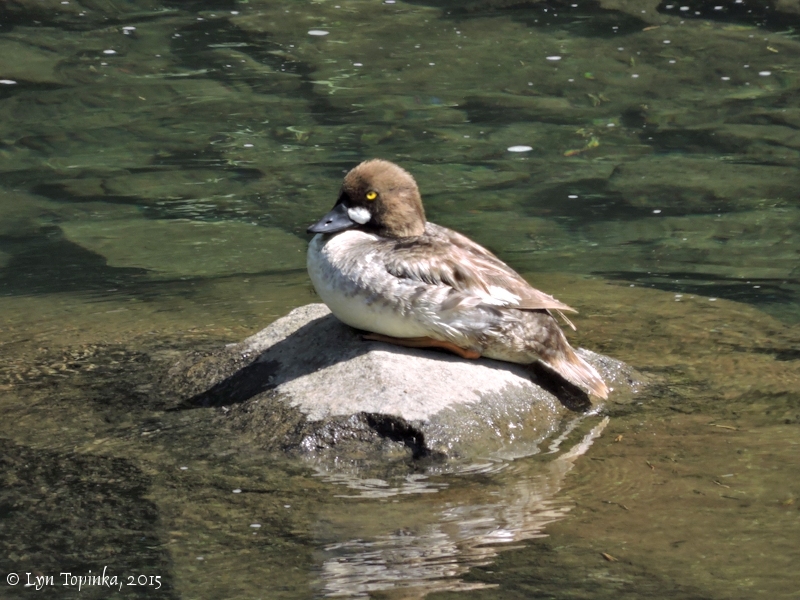 Image taken May 9, 2015. 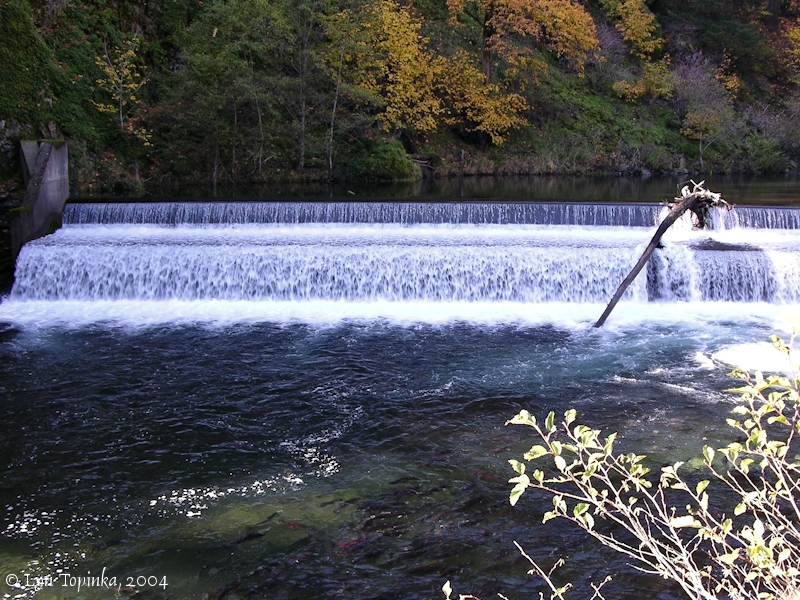 Prior to the construction of Bonneville Dam in 1938, a limited amount of natural production by anadromous fish occurred in the Little White Salmon River below the falls, a section of the river which has been inundated by the construction of Bonneville Dam. Historically, fall chinook, spring chinook, coho and steelhead are believed to have utilized the area. 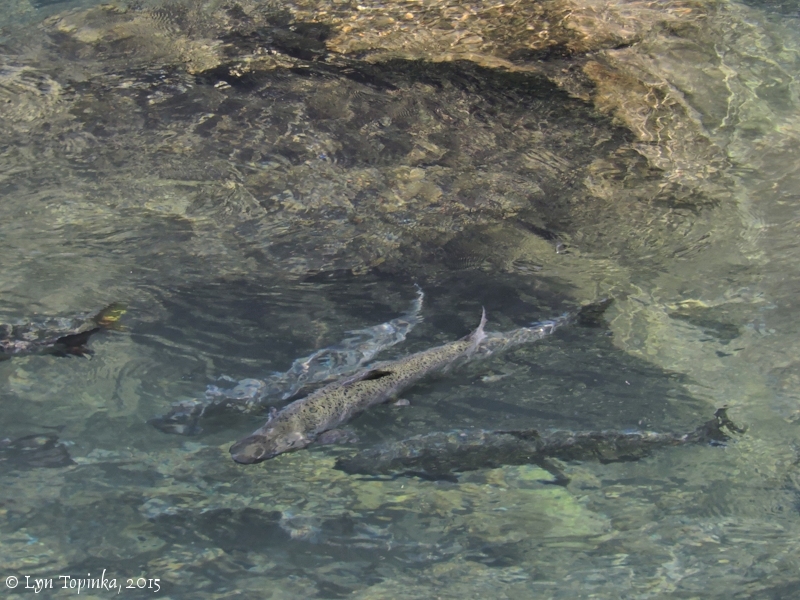 Currently only hatchery reared fish return to the river. 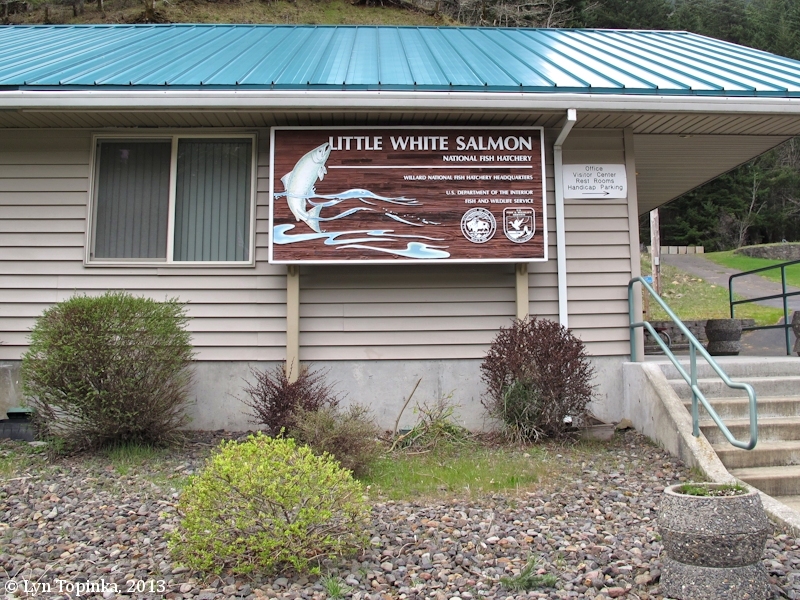 Little White Salmon National Fish Hatchery was built in 1898 and is one of the oldest on the Columbia River system. It is operated by the U.S. 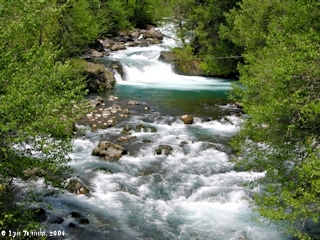 Fish and Wildlife Service and is located approximately two miles above the mouth of the Little White Salmon River near Cook, Washington. The hatchery was modernized as part of the Mitchell Act Program in 1949. 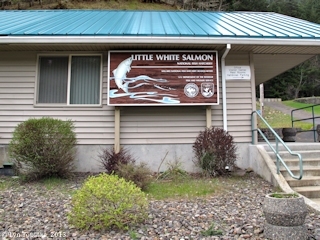 Click image to enlarge Little White Salmon National Fish Hatchery, Washington. Image taken March 24, 2013. 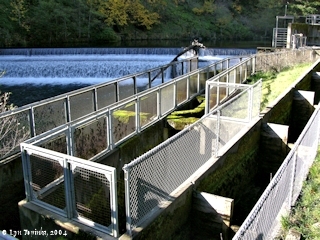 Click image to enlarge Falls and ladder at Little White Salmon Fish Hatchery. Image taken November 4, 2004. 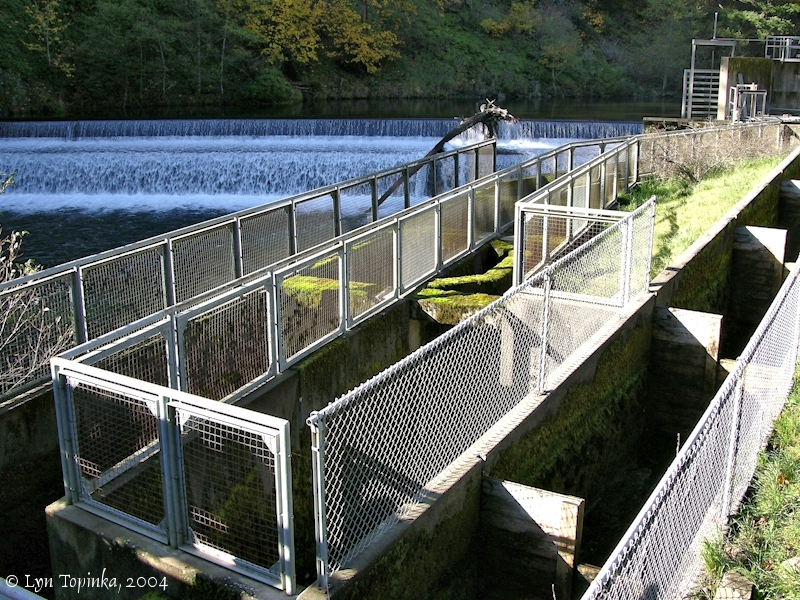 Click image to enlarge Falls at Little White Salmon Fish Hatchery. Image taken November 4, 2004. Click image to enlarge Little White Salmon River at Willard, Washington. View looking downstream from the Cook-Underwood Road. Image taken March 18, 2013. 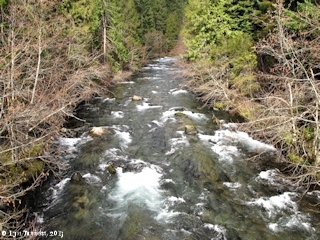 Click image to enlarge Little White Salmon River at Willard, Washington. View looking upstream from the Cook-Underwood Road. Image taken May 10, 2006. 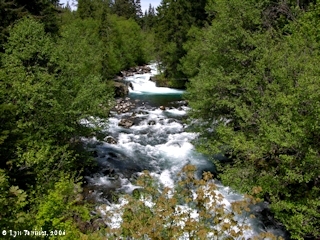 Click image to enlarge Falls, Little White Salmon River at Willard, Washington. 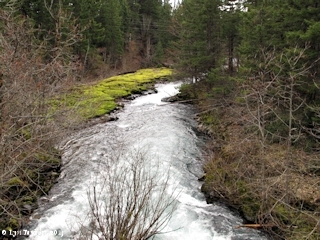 Small falls in the rapids on the Little White Salmon River. View looking upstream from the Cook-Underwood Road. Image taken May 10, 2006. 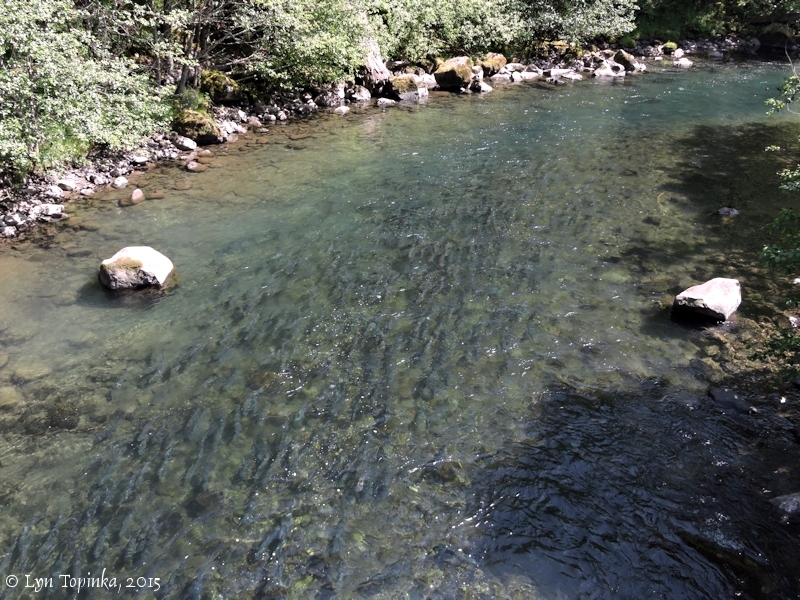 Click image to enlarge Little White Salmon River at Willard, Washington. 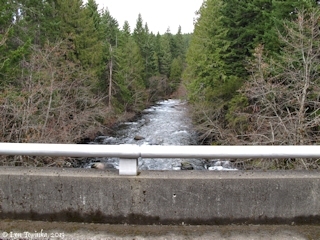 View looking downstream from the Cook-Underwood Road. Image taken May 10, 2006.